You know how sometimes, even when you’re tired and a bit grumpy, something happens to make you smile, something so simple and so special that you just want to fix it in your mind forever? 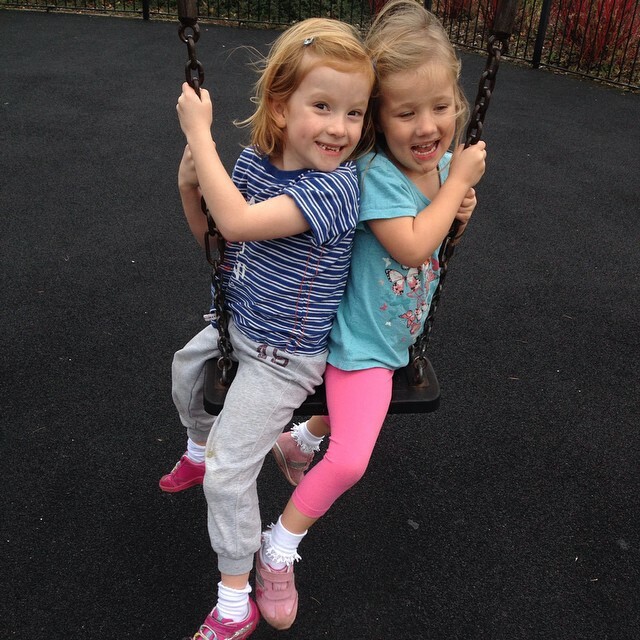 That’s what happened in the park today, these two climbed on a swing together and giggled hysterically. Such a welcome change from the more usual bickering over who gets to swing first. When they’re on form they are the sweetest, most loving pair of little girls you could wish to spend time with. They spent hours today making paper chains and building LEGO, chattering away. I couldn’t have asked for a nicer way to start half term. Lovely Emma you have to grab those lovely sibling moments don’t you and store them up in . Becky recently posted..Fancy a #ThriftyXmas Twitter Party? We’ve had a few of those moments too and it makes me realise how grumpy I really am with them most of the time!